Aqua Man Candy is made with a cyan-shimmered cyan base saturated with cyan glitters with red, pink, white and green accents. Shown is 1 coat over 2 coats of L.A. Girl Electric Coral. 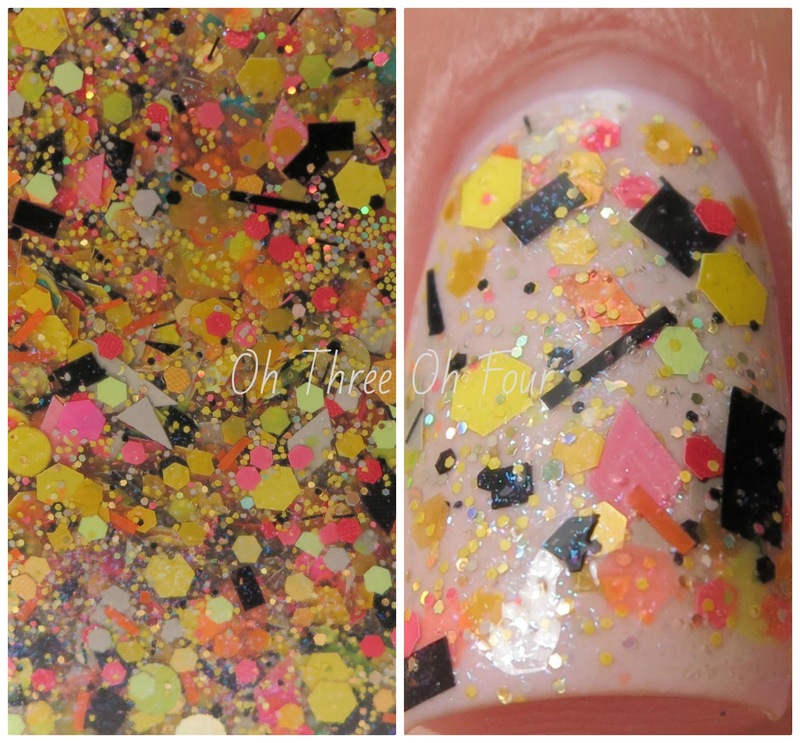 It's Raining Shaman contains neon, opaque and satin yellows and oranges with black, grey, pink, red and multi-glitter and holographic gold micro-glitter and multi-shimmer in a clear base. All nails are 2 coats of It's Raining Shaman over 3 coats of Flower Cosmetics I Lavendare You! Mr. Darcy has multiple shades of grey, as well as lavender, gunmetal, periwinkle, and navy as well as a kiss of red in a clear base. 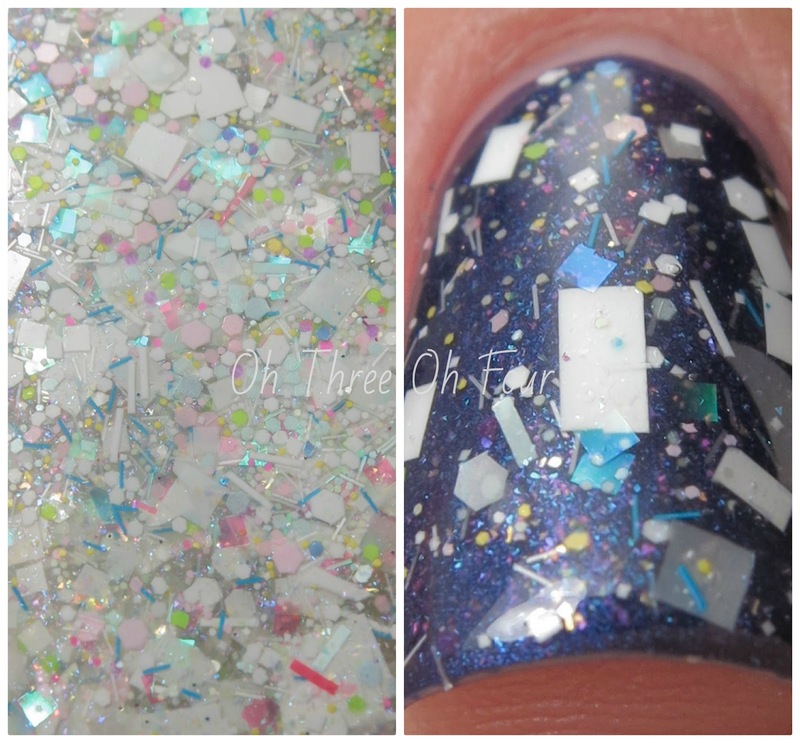 I used 2 coats of Mr. Darcy over 3 coats Sinful Colors Unicorn for this manicure. Mr. Pink contains assorted pinks of all sizes, shapes, finishes and attitude with Multiglitter accents in a warm pink shimmered clear base. I started with 3 coats of China Glaze Keepin it Teal and added 2 coats of Mr. Pink for these photos. Oh Eric...! has red metallic with neon pink, purple and red glitters in a pink-shimmered translucent red base. All nails are 3 coats of Sinful Colors Purple Diamond with 1 coat of Oh Eric...!. Once Upon a Prince has multiple purples accented with scattered multi-glitter in a rich, translucent purple and blue shimmered purple base. I used 1 coat over 2 coats of Wet n Wild Teal Slowly and See. The Full Minty has satin mint and white glitters accented with several shades of green—all in an intensely sparkling mint-shimmered base. 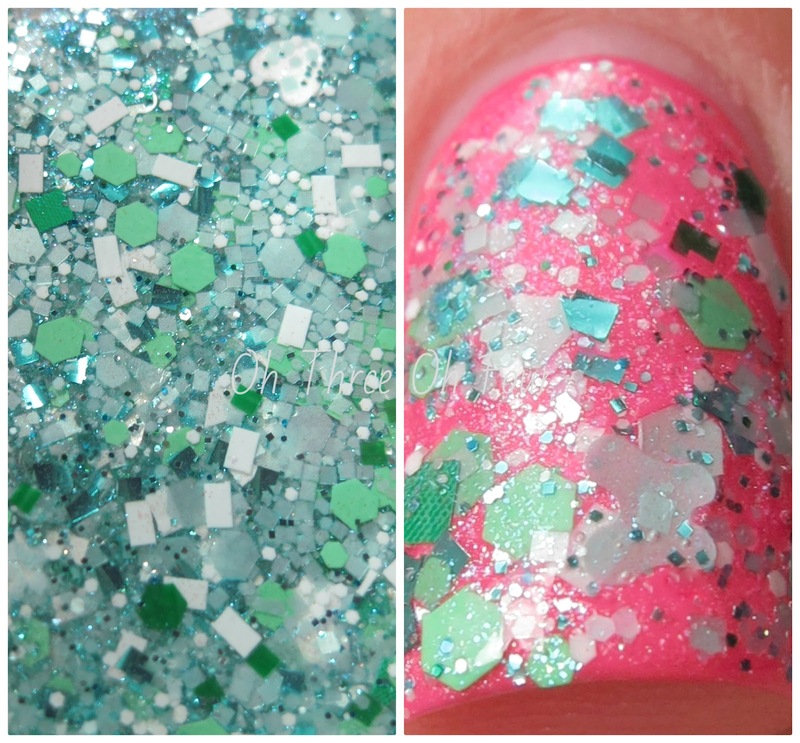 These photos are 2 coats of an unbranded polish named Wild Thing (it's a super hot pink, my camera was not wanting to capture it >_<)with 2 coats of The Full Minty. The One Who Got Away is full of assorted black and bright colored glitter in matte and satin finishes and micro-glitter accents in a clear base. All nails are 1 coat of The One That Got Away over 3 coats of China Glaze Sun of a Peach. Tidy Whities is a mixture of opaque and translucent whites with assorted tiny pastel and iridescent glitters and multi-shimmer in a clear base. 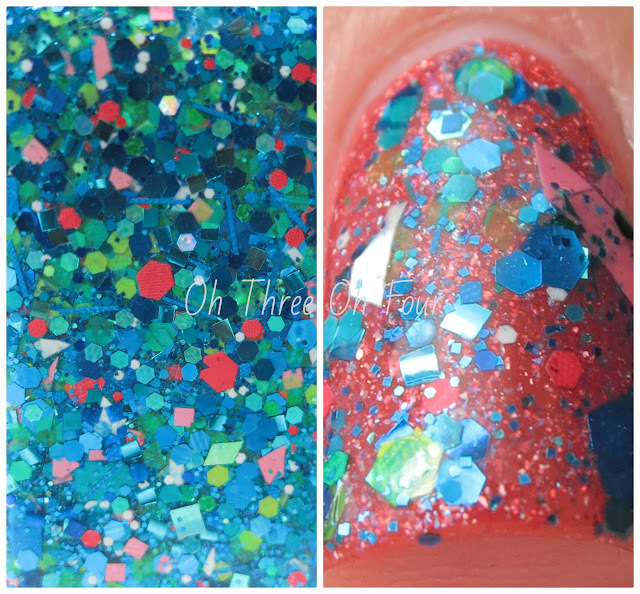 Shown is 2 coats of Zoya Neve with 2 coats of Tidy Whities. This collection will be released later today through Lynnderella.com and soon through Norway Nails or Glitter Connect. Follow all the Lynnderella fan pages on Facebook, Twitter, Instagram, Pinterest and Tumblr.